Master metalsmith Cyril Colnik (1871–1958) was an Austrian-born artist who parlayed a gold medal at the 1893 World’s Columbian Exposition in Chicago into a sixty-year career creating marvelously intricate gates, balustrades, chandeliers, grilles, architectural ornaments, and other decor for public buildings and the mansions of the wealthy in the “German Athens” of America—Milwaukee, Wisconsin. Legend has it that beer baron Captain Frederick Pabst convinced Colnik to come to Milwaukee, pointing to the commissions the talented craftsman could get from wealthy industrialists and merchants. Colnik’s artistry and technical mastery transformed metal into works of beauty and permanence for clients including Pabst, Charles Allis of Allis-Chalmers Inc., Herman Uihlein of Schlitz Brewing Co., Lloyd Smith of the A. O. Smith Corporation, and many others. Colnik’s creations in iron, brass, and bronze can still be seen at the Pabst Mansion house museum, Milwaukee’s City Hall, Mader’s Restaurant, Wisconsin Memorial Park, and in many other older buildings around the city. The largest collection is in Milwaukee’s Villa Terrace Decorative Arts Museum (formerly the mansion of the Smith family), where visitors can see both the wrought metalwork that Colnik created for the Smith home and a permanent exhibition of objects, photographs, and archival material by and about Colnik. The exhibition includes the tools of a blacksmith shop, complete with forge and anvil. 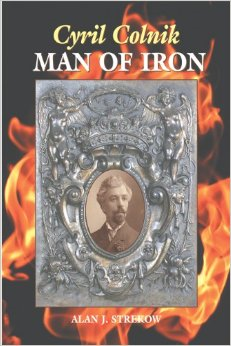 Cyril Colnik, Man of Iron is the first book to document this metalsmith’s masterworks. It includes a biographical essay on Colnik and chapters that showcase the riches of the Villa Terrace’s Colnik collection and archives: photos of architectural features and collected objects at the Villa Terrace; examples of Colnik’s sketches, blueprints, and photographs; a trove of photos from Colnik’s personal collection that documented his work in now-unidentified homes and churches; and interior and exterior photographs of identifiable Milwaukee homes, businesses, and public buildings taken by Colnik, author Alan J. Strekow, and others. The book also includes an essay by present-day artisanal ironworker Daniel Nauman, a glossary of blacksmithing terms, a chronology of Colnik’s life and achievements, and a bibliography.